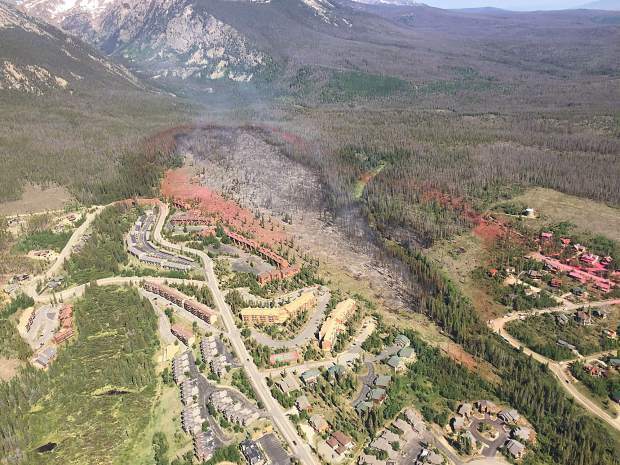 An aerial view of the immediate aftermath of the Buffalo Mountain Fire. The thick red lines surrounding the fire are the fire retardant lines dropped by air tankers in the first hours. Fire is an insatiable, indomitable enemy that can’t be bargained or reasoned with. It is one of the great forces of nature; one that grows in size and strength with each tree, bush and grass blade it touches. The only defense humans have is in our wits — our ability to collectively plan, strategize and adapt to circumstances as they develop to overcome physical limitations. On Wednesday, a month after the Buffalo Mountain Fire was defeated, the U.S. Forest Service provided the first in-depth, chronological look at how the response to the fire developed during the bimonthly Forest Health Task Force meeting. Deputy district ranger Adam Bianchi and prescribed fire and fuels specialist Lisa Loncar gave a presentation detailing the day-by-day response to the fire. As with anything dealing with wildfire, the first few hours were critical to the fate of everyone fighting or fleeing it. Bianchi started with the first sighting of the fire at around 10:45 a.m. on Tuesday, June 12. 911 lit up as sightings of a small but growing plume of white smoke was spotted on the eastern slope of Buffalo Mountain. The initial response came from locals — Summit Fire & EMS and the Red, White and Blue fire district — and local U.S. Forest Service assets. Summit Fire Chief Jeff Berino was the first unified incident commander. The initial thing he did was order an Air Tactical Group Supervisor, or “air attack,” to do high-altitude aircraft surveillance of the fire to get intelligence on it; how large it was, how hot, which direction it was going and what structures were being threatened. The preliminary report from air attack was very worrying — the fire was “rolling downhill and east, and wasn’t looking good” as it got closer and closer to Mesa Cortina. “That term — ‘rolling’ — isn’t something you usually hear about a wildfire,” Bianchi told the task force, giving a vision of an avalanche of fire gaining momentum as it barreled down the mountain. Using an infrared camera, air attack was also able to determine that the fire was very intense — meaning large flames, extreme heat and high aggressiveness in the treetops. This fire was not going to be stopped until it ran out of fuel and at the moment winds were pushing it into a grove of Aspen trees running between two neighborhoods that might as well have been an oil slick. That’s when Berino made the decision to order the massive aerial response, including two Very Large Air Tankers, modified DC-10s, that can drop wide, heavy lines of fire retardant between the fire and the people or structures it threatens. Bianchi and Loncar showed a photo of the entire fire and how it was stopped dead in its tracks by thick red lines of retardant on the north and south. Loncar also explained that the difference between the fixed-wing air tankers and the helicopters was like the difference between using a large club and a scalpel. On the southeast corner, firefighters were able to make a stand in clear-cut areas created by the U.S. Forest Service years ago. Loncar, who served as one of the last incident commanders in the fight, explained that the fire breaks were not there to necessarily stop the fire in its tracks, but to give firefighters room to quickly and safely get into the forest, dig fire lines and engage the fire from a safe distance. As the day went on, the challenges and logistics got bigger and more complex. The evacuation of 1,400 homes at the top of the mountain required more resources and personnel than local authorities have available. Procedures and relationships worked out over decades meant there was seamless transition between gradually increasing levels of incident management teams with more people, resources and experience available at each level to free up local resources for non-operational tasks. On the afternoon of the 12th, incident command transitioned from locals to a Type III incident management team led by Jim Genung, fuel specialist for the White River National Forest. On the 14th, command transitioned to a Type II team, the Rocky Mountain Incident Management Blue Team led by Jay Esperance, who is also the director of wildland fire suppression for the entire state of South Dakota. On June 15 and 16, cooler weather calmed the fire a bit and allowed firefighters to make a lot of progress creating and holding a fire line and doing mop-up of the hot spots remaining. Evacuations were lifted, and by the 17th the logistics of the operation had slowed and eased enough that command transitioned back to a local Type 4 team commanded by Loncar. By the 20th, the fire was 100 percent contained. Not a single home was damaged, and aside from a firefighter suffering a minor injury, there were no human casualties. That was due in large part to how incident command transitions went off without a hitch. Bianchi said that the fire has been determined to be human-caused, but that the investigation is ongoing.